Students, alumni and others who visit Greenville’s beautiful Furman University campus might have noticed the attention to detail regarding the decor, especially in the newer and remodeled buildings. 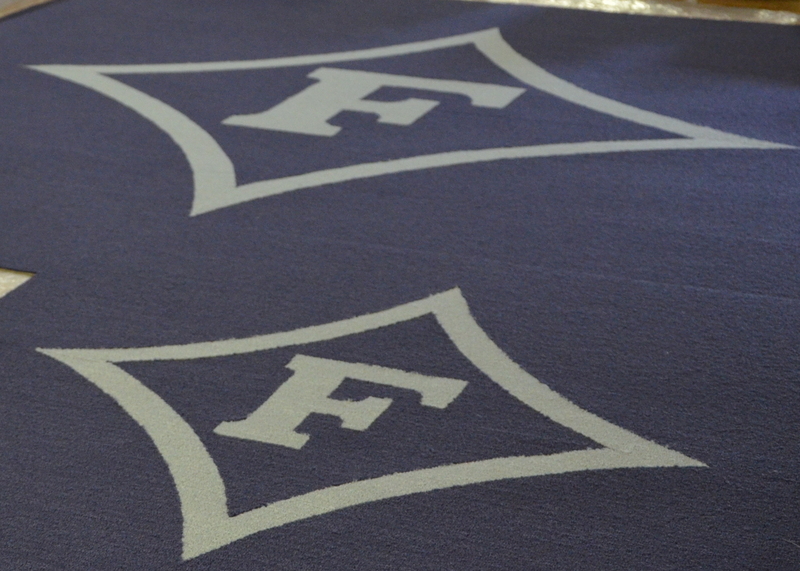 There are some nice touches, such as integrating the school’s logo into carpets. McAbee’s is proud to have participated in the most recent projects and many others over the years. If you are wanting a custom inlaid carpet or rug, we would be happy to talk with you about it. Call us at 864-277-0470 or use the contact form on our website. An article over on the BBC details exciting news about research being done regarding how carpets can be used to detect or even predict falls. The “magic carpet” that was demonstrated had a grid of sensors beneath it comprised of fiber optic strands that detect and plot movement as pressure from above bends them. Detectors at the edge of the carpet then convert the light returned into a signal that a computer then analyzed. Can you imagine the uses for this type of carpet in the homes of our elderly? As we age, we want to keep our independence, and children want to maintain our safety. Carpets with sensors such as this could provide the peace of mind required for both. Earlier this month we had the pleasure of helping a customer design a unique rug for her living room. The new rug was part of her home renovation in anticipation of her son getting married next year and all of the entertaining of friends and family that goes along with such an occasion. After bringing into McAbee’s Custom Carpet her furniture fabrics, we were able to pull some carpet samples for her to take home and view in the room with her home lighting. 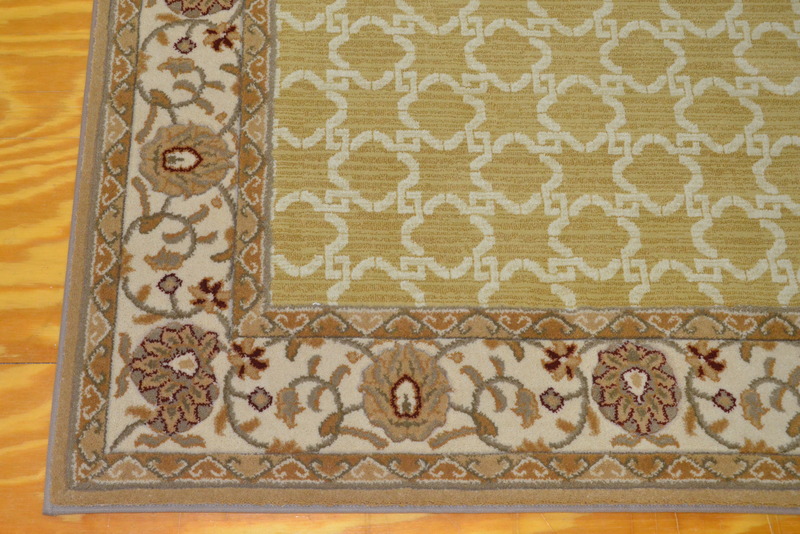 The customer expressed that she would also like for the rug to have a border of another material that complemented her fabrics but did not want an overall look of an oriental rug. The carpet materials that were chosen were not sold together as a suggested field material and border, but we chose them as the colors matched and together they made for a beautiful compilation. Once the ordered materials arrive at McAbee’s Custom Carpet, the rug is fabricated with the border, the edge finished with binding, and a felt pad is cut to cushion underneath. The customer was thrilled with this one of a kind finished product! McAbee’s Custom Carpet is on Facebook, please connect with us! If you appreciate beautiful decor, especially floor coverings like carpet, rugs, stair runners & rods and the like, then you should go to our Facebook page at https://www.facebook.com/McAbeesCarpet and “LIKE” us! We will begin posting content including pictures of new styles of carpets and rugs, projects, specials and maybe a contest or two that could score you a free or discounted area rug if you are in the Greenville, Simpsonville, Spartanburg, Taylors, Greer, Anderson, Easley area (anywhere in the Upstate of South Carolina). Sure, we’ll update our website too, but Facebook may be the more timely method to deliver information straight to your timeline. Don’t worry, we’re not going to be posting what we eat for lunch. Unless it is totally delicious. We’ve got the Upstate covered (Greenville, Anderson, Spartanburg, Simpsonville), in carpet and rugs! If you are considering a purchase of carpet, an area rug, hall or stair runner, stair rods or whatever the interior design floor covering project may call for, please remember that even though the McAbee’s Custom Carpet showroom is in Greenville, we provide sales, service, installation, cleaning, design and consultation to the entire Upstate! Over the years people in every Upstate city, town or community have purchased from us, including Simpsonville, Anderson, Spartanburg, Taylors, Greer, Six Mile, Easley, Liberty, Clemson, Boiling Springs, Duncan, Berea, Seneca and anywhere else you can imagine! The McAbee’s delivery van is a regular sight at Cliffs Communities (Glassy Mountain and others), River Reserve, Augusta Rd, Chanticleer and just about every neighborhood within an hour’s drive of Greenville SC. Stop in and see us, or we can go to you! Call us today or use our contact link in the navigation bar for more information. Most people will never give the underlying padding that accompanies a carpet or rug much thought at all, when in fact, it is one of the most important elements in any successful install! Carpet padding (also called carpet cushion) is the very foundation that your carpet or rug installation rests upon, and just like your home, a poor foundation can and likely will affect the integrity. What is the purpose of carpet padding? The first thing that comes to mind is that it is for comfort, which is partially true in some situations but primarily, the pad will provide the needed cushion to help absorb the impact that can cause synthetic latex to break down, the backings to stretch and delamination (the separation of the primary backing from the secondary backing) in addition to unnecessary stress on the face fiber. The life of the carpet installation can be extended dramatically with the careful paring of carpet and carpet pad. A little known fact is that it is the thickest padding that may shorten the life of your carpet! Here at McAbee’s Custom Carpet, the pad is every bit as important as the carpet or rug itself. 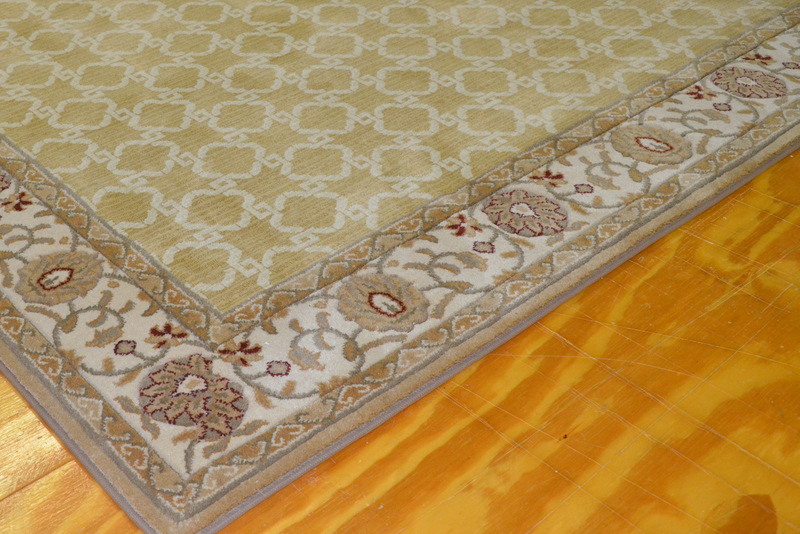 We will take into consideration the composition of the carpet and provide the proper padding for the job, whether it calls for urethane foam padding, waffle rubber padding, flat rubber padding, fiber padding or bonded urethane padding and the thickness needed. Beware of other carpet and rug sales and installation companies which will use carpet padding that is not designed for the job, simply because they have a large stockpile of it. There is no one-size-fits-all solution in carpet padding! If you would like to discuss carpet or carpet padding for your next project, please give us a call or use our contact form to arrange a consultation. We are your Greenville and Upstate source for the best carpet padding and carpet cushion available! Do it right, the first time! Our new web site is nearing finalization! We have finalized the structure of the McAbee’s Custom Carpet website structure! Our most popular areas of the site are in the main navigation bar, and subcategories have been added as “dropdowns”. For example, while selecting “Products” would take you to a page describing our product offerings, hovering over the “Products” link will present a list of a few of our most requested manufacturers such as Masland, Shaw, Robertex, Mohawk and the like, selecting those items would direct you to the corresponding page. Obviously, if you are here today, you are seeing links and pages without much content, but please, check back in a a few days to see how we progress. Your input is very important to us! In the same way we want to help design, make and install your dream rug, we also want to a website that will be a pleasure for you to use, so please, if you would, share your opinions with us! You can reply to this posting or use our contact form, or do it the old fashioned way and pick up the phone and call us. Thanks to Homeland Secure IT for their assistance and expertise with the changeover site to the easy-to-manage WordPress from the antiquated layout. Thank you for your patience while we remodel. We’re working on our site right this very minute, please, check back daily to watch our progress!